“Charity…does not behave itself unseemly, seeketh not her own, is not easily provoked, thinketh no evil; rejoiceth not in iniquity, but rejoiceth in the truth” (1 Corinthians 13:5, 6). The KJV of the Bible uses the word “charity” instead of love. Charity means “in a general sense, love, benevolence, good will; that disposition of heart which inclines men to think favorably of their fellow men, and to do them good.” Charity helps define what love is more clearly. Love is an action not a feeling. It’s an action of good will and love towards others not evil. “Charity dos not behave itself unseemly.” Gill’s Exposition of the Bible interprets the word “unseemly” to mean “by using either unbecoming words, or doing indecent actions.” We are to not let any unwholesome words come out of our mouths “but that which is good to the use of edifying, that it may minister grace unto the hearers” (Ephesians 4:29). We don’t cuss, swear, or slander others. We aren’t loud and demanding to be heard. We speak the truth in love. We aren’t rude to people. We are discreet with our actions and how we treat other people. We show kindness to everyone. We pursue modesty, femininity, and gentleness in all of our ways. Learning to have a meek and quiet spirit is one of our greatest goals. 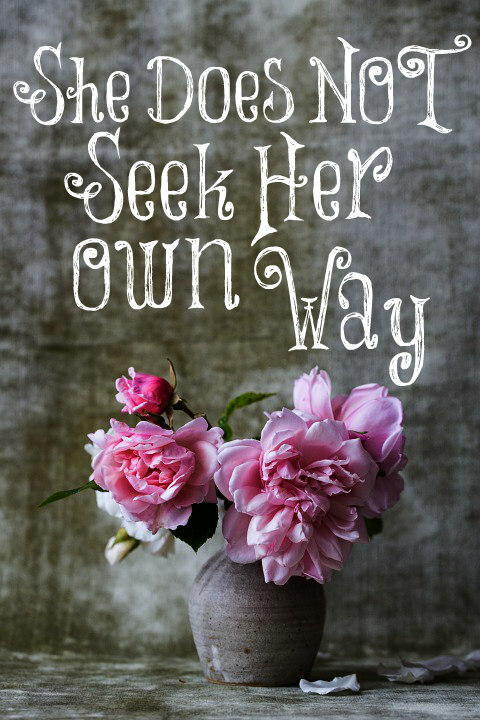 “Charity seeketh not her own.” Yes, she seeks what is best for her husband as his help meet. She seeks what is best for her precious children, not what she wants to do and not pursuing her goals and dreams. She knows that they need and want her with them full time. This is what is best for them. She seeks what is best for her home and makes it a place of refuge in the storms of life. She wants a lovely and peaceful home where her family will feel well loved and cared for. This means she must sacrifice her pleasures and what culture tells her to do for the good of her family which is to be a keeper at home as God requires (Titus 2:5). “Charity is not easily provoked.” Provoke means “to make angry; to offend; to enrage.” Many women are easily provoked simply for not agreeing with others. They have no charity towards others. They allow their feelings and emotions to control their behavior instead of what is true and right, and we wonder why the divorce rate is so high. On the other hand, a woman who is not easily provoked shows charity to others by allowing them to have opinions contrary to her own without getting upset and angry. The only thing that provokes her is sin and Satan. She is patient and kind towards others as she is called to be. She loves others more than she loves herself. “Charity thinketh no evil.” A woman who is full of charity tries to find the good in life instead of dwelling upon the evil and trying to find things to complain about. She finds the good in people, too, and dwells upon these instead. She doesn’t make up slander about others in order to tear them down. She doesn’t think evil of the president or any of the leaders but prays for them instead. If she is upset with someone, she gives it to the Lord instead of thinking evil about them. She doesn’t allow bitterness to grow in her heart since she knows that this defiles many (Hebrews 12:15). A godly woman loves and cares for others deeply. She is available to help when there is a need. She loves being there for people and making their lives easier. Let’s be this kind of woman! Charity…beareth all things, believeth all things, hopeth all things, endureth all things. The meek and quiet are just as strong in their own special way to the forceful. Women used to have that elegance and lady like grace about them, quiet, patient, nurturing, but now, are corrupted into being strident loudmouths! The traditional woman, such as our grandmothers and those before them are a dying breed! What a shame! This was beautiful to read and so was the video talk about your mother. Thank you for continually sharing what is good and true and right and being faithful to your call as an older woman. I LOVE this Lori! Thankyou. Just what I needed today. Beautiful explanation of 1 Corinthians 13. God and the righteous are only angry with the wicked. I’ve known many women who become outraged and enraged at anyone just disagreeing with them. They are the brawling women that Solomon talked about in Proverbs. He also talked about the angry and contentious woman. Kind of sad because so many women in America rebel against a husband, and yet, if they get their way and destroy America, because women who divorce their husbands for unscriptural reasons with children are a drain on society, they will likely have truly wicked men. Kind of tragic. So true. I understand the world being lost and choosing foolishness but it is sad when those who profess Christ do as well. I’ve seen this a lot within our current political climate. It is okay to call people nazis, racists, and other unkind epithets if you disagree with them. I think it is so common women start believing their own name calling. No one wants to address anyone else in a loving manner. Instead of “Love your enemy” it is exalt yourself over them and tell the world what a better person you are than they. How will the world see Christ if Christians can’t even be kind to one another? What would be the appropriate way to “share the truth in Love” as Lori says to those who are racist and share their racist views with you or are family members you must see? I have learned a lot the hard way. As a teen and younger woman I was always up for a debate. Despite being a good debater and knowing the Bible better than most, I never once changed anyone’s mind by debating. I did find though that Jesus was right, “They’ll know you are Christians by your love.” The minds that I did help change were through being kind. I have several stories but I’ll stick to my racist grandfather-in-law. He was born in the early 30s and racism was prevalent where he lived. He wasn’t a Christian either. His son became a Christian and the whole family. They tried to convince him but he remained an ornery philanderer. He refused to attend his pride and joy grandson’s wedding (my husband) because they are white and I’m black. I never took it personally and realized that was his own issue so it was easy to be nice to him. I even invited myself to go visit and stay at his home for a couple of days without my husband (we didn’t have kids at the time). Long story shorter. Three days before he died he became a Christian. While in hospice before that he proudly showed all the nurses the card I sent to him and lamented what a racist he was and told all of them I was black and how foolish he had been to have been a racist. So I only “point out the truth in love” to those I believe God has put under my teaching (like my kids or a younger women ) or those that I’m really close to AND have a great relationship with, like my husband. M – I love this! Especially your last sentence. I spoke along similar lines to that at our little fellowship meeting a few weeks ago. Kindness. Jesus asks it of us. He modeled it for us. But it’s getting so hard to find, even among Christians. And I’ve noticed that acts of kindness, no matter how small, have such a HUGE affect. Amen to that. Jesus did model it. Even the smallest act is meaningful to the person who is on the receiving end. The Bible tells us to exhort one another on to love and good works. We definitely need to do more of that than tearing each other down. I knew a lady just like this. She was the most loving, beautiful Christ-like woman I have ever had the privilege to meet. She always, always saw the good in people. I never heard her say anything bad about anyone, ever. She had the most amazing ability to “point out the truth in love”, only she truly did do it in love, not the way many people do it. Gentleness and love filled her words and her actions. Sadly, she’s gone to be with the Lord now, but she left behind an incredible legacy and a beautiful example. Women like this has such a positive influence on the lives of every single person that they meet. I need to save this post to read every morning before I start my day. Thank you Lori, for the beautiful reminder of what we need to be. My daily mantra is “What is more important, winning the fight or strengthening the relationship I have with my family members and friends?” If I start from this position, it is more likely that I will treat everyone with dignity and respect and kindness. My husband has a quick temper and is often grumpy, but I am usually able to soften his temper by keeping my own on a even keel. I have also learned that a sincere apology can go a long way when I have offended a friend or family member. I think, in any relationship, one has to choose their battles wisely. Is it worth disagreeing about? Sometimes we let little things get under our skin and cause quarrels.